While the Estrilid clade is primarily old world and southern, its Passerid sister clade is cosmopolitan. More precisely, the nine-primaried oscinces are cosmopolitan, while their sister group, the Passeridae, are restricted to the Old World. The Passeridae are seed-eating birds, primarily distributed in the southern portion of the Palearctic, but ranging into the Afrotropics. Several passerids are closely associated with humans, especially the ubiquitous House Sparrow, which has spread worldwide. Dickinson et al. (2003) consider Plocepasser, Histurgops, Pseudonigrita, and Philetairus to be Passeridae. However, Groth (1998) found them to be in the Ploceidae. The most astonishing change in the Passeridae is due to Fjeldså et al. (2010). They found that the Cinnamon Ibon, long thought to be an abberant white-eye, is actually a sparrow. This is a canopy bird from the cloud-forest of Mindanao, in the Philippines. It's a long way from anything we think of as sparrows. It's also a long way physically. The nearest native populations of any sparrows are on the Asian mainland. Nonetheless, it is a sparrow. Indeed, Fjeldså et al. report than its skull is similar to a sparrow, and that it has many other features in common with the other Passeridae. Interestingly enough, the Pale Rockfinch (Carpospiza) also appears to be only distantly related to the other Passeridae. This was hinted at some time ago, and it had been suggested by H. Mendelssohn (fide HBW-14) that it did not even belong in Passeridae. To my knowledge, it has not been included in any published phylogeny. However, samples from the 16S and cox-1 genes are available, and were used in an unpublished tree by Raty. Its position was not fully resolved, but it may be as distant from the other Passeridae as the Ibon is. Price et al. (2014) included one species of Gymnoris in their analysis while Qu et al. (2006) examined the snowfinches. The genus tree is based on a combination of Fjeldså et al. (2010), Price et al. (2014), Qu et al. (2006) and Raty. The order of species in Passer does not seem to be quite correct, but Allende et al. (2001) do not consider enough species for reorganization of Passer to be helpful at this time. Moreover, their results were quite soft. Qu et al. (2006) was helpful concerning the snowfinch genera. Different sources treat the Rufous Sparrow (Passer motitensis) complex differently. Here it is treated as 5 species: iagoensis, motitensis (including benguellensis and subsolanus), rufocinctus (including cordofanicus and shellyi), insularis, and hemileucus. See Kirwan (2008) for arguments that the small pale hemileucus should be split from insularis. As in the IOC list, the name Great Sparrow is used for the narrowly defined Passer motitensis. The Italian Sparrow, Passer italiae, is recognized as a separate species based on Hermansen et al. (2011) and Elvgin et al. (2011). Although Töpfer (2006) had argued that it was a subspecies of the Spanish Sparrow, based on apparent ongoing hybridization, Hermansen et al. (2011) find that this is not the case. Rather, their genetic data found that the sympatric populations in Italy's Gargano Peninsula showed no evidence of gene flow. However, they did find a hybrid zone with the House Sparrow in the Alps. The hybrid zone appears narrow and relatively stable, and does not suggest substantial ongoing gene flow (and they did not find evidence of any). The twin papers produced by a group at Oslo, Hermansen et al. (2011) and Elgvin et al. 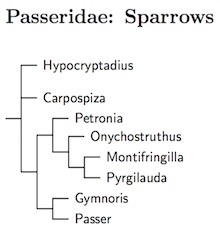 (2011), explore the evidence that the Italian Sparrow is the result of past hybridization between the House and Spanish Sparrows. Finally, the Asian subspecies Zarudny's Sparrow, Passer zarudnyi, has been split from Desert Sparrow, Passer simplex, which now contains only the African subspecies (Kirwan et al., 2009). The nine-primaried oscines are called that because they appear to have nine primary feathers. Actually, they have ten primaries, but the tenth primary is reduced and usually hidden under the ninth primary covert (Hall, 2004). This sometimes occurs in birds outside the nine-primaried oscine group, but is most characteristic of this group. The basal division in the nine-primaried oscines is between the Motacillidae and the “finches”, Sibley and Monroe's broadly-defined Fringillidae. Wagtails and pipits are cosmopolitan. They are typically open country insectivores. The Motacillidae include two species that were long thought of as belonging to Sylviidae, the Sao Tome Shorttail (Amaurocichla), and the Madanga (Madanga). The Sao Tome Shorttail (or Bocage's Longbill) was thought to be related to the Macrosphenus longbills. When the old Sylviidae were broken up, that put it in the crombec family, Macrosphenidae. However, Johansson et al. (2008b) results suggested by it was related to the wagtails and pipits, and possibly sister to the wagtails. Alström et al. (2015a) found it was not only related to the wagtails, but is actually part of Motacilla. More surprisingly, Alström et al. (2015a) also found that the Madanga is actually a pipit, not a white-eye (Sylviioidea: Zosteropidae). In fact, it falls in the genus Anthus. Its closest relative seems to be the Alpine Pipit, Anthus gutturalis. Laurent Raty has pointed out a complication. In 1831, Lesson used the name Anthus ruficollis. The Madanga wasn't named until 1923 by Rothschild and Hartert, so Lesson's ruficollis has priority if both species are placed in Anthus. The fact that Lesson's ruficollis is a junior synonym of Anthus cervinus (orginally Motacilla cervina Pallas 1811) does not eliminate the conflict. Until either a new name is proposed or Lesson's name Anthus ruficollis is suppressed, the Madanga won't have a proper scientic name. For the present, I will refer to it as Anthus “ruficollis”. 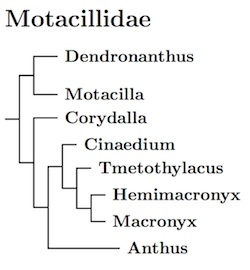 The overall organization of the Motacillidae is based on a combination of Alström et al. (2015a), Drovetski et al. (2018), Harris et al. (2018), Outlaw and Voelker (2006b), Van Ells and Norambuena (2018), and Voelker and Edwards (1998). When there are disagreements, the more recent papers have been given heavier weight. One interesting thing in Alström et al. (2015a) is that their multigene analysis yields a different placement of the longclaws compared with Outlaw and Voelker (2006b). The limited taxon sampling leaves some residual uncertainty, but it has caused me to separate some of Anthus in Corydalla (Vigors, 1825, type richardi) and Cinaedium (Sundevall, 1850, type lineiventre). The wagtails, and particularly the yellow-colored wagtails, are more troublesome. Mitochondrial DNA analysis (Alström and Mild, 2003; Ödeen and Bjöklund, 2003; Outlaw and Voelker, 2006b, Pavlova et al., 2003) suggests that there are two species of Citrine Wagtail (citreola and werae) and three species of Yellow Wagtail (flava, taivana, and tschutschensis). The AOU has adopted the split of the Eastern Yellow Wagtail (tschutschensis), but takes no official position on the 3-way split. Christidis and Boles (2008) accept the 3-way split with Green-headed Yellow Wagtail, Motacilla taivana, being the third species. These splits are not followed by Alström and Mild (2003) or by Ödeen and Björklund (2003), both of which also consider nuclear DNA. The nuclear DNA yields a different tree for the wagtails, where macronyx, taivana and tschutschensis form a clade that can be regarded as a species: Eastern Yellow Wagtail, Motacilla tschutschensis. This species is sister to the Gray Wagtail, Motacilla cinerea. The citrine wagtails end up as sisters, and can also be regarded as a single species. Ödeen and Björklund (2003) argue that the mitochondrial tree reflects the effects of past hybridization. In the end, I have gone with the recent analysis by Harris et al. (2018). This treats the Citrine and Eastern Yellow Wagtails as sister species, with the Western Yellow Wagtail sister to both, and the whole lot sister to the Gray Wagtail. Drovetski et al. (2018) has a bit different arrangment. There have also been questions concerning whether the White Wagtail is a single species. Some authorities have separated lugens as Black-backed Wagtail and yarrelli as Pied Wagtail. However, it is hard to make a genetic case for either of these (see Alström and Mild, 2003; Pavlova et al., 2005; Voelker, 2002), with yarrelli ending up near alba and alba and lugens intertwinned. Australasian Pipit, Corydalla novaeseelandiae, has been split into Australian Pipit, Corydalla australis, and New Zealand Pipit, Corydalla novaeseelandiae. This split was recommended by Schodde and Mason (1999), but rejected by Christidis and Boles (2008) “in the absence of molecular evidence”. Tavares and Baker (2008) provided limited molecular evidence in the form of a barcode divergence of 4.1%, which is a good indication that they are separate species. Based on Davies and Peacock (2014), the Kimberley Pipit, Anthus pseudosimilis, is considered conspecific with African Pipit, Anthus cinnamomeus, and the Long-tailed Pipit, Anthus longicaudatus, is considered conspecific with Buffy Pipit, Anthus vaalensis. In both cases, the original collections seem to involve several taxa. The New World pipits have been rearranged based on Van Ells and Norambuena (2018). Further, their analysis resulted in two splits and one lump. Puna Pipit, Anthus brevirostris, has been split from Short-billed Pipit, Anthus furcatus. South Georgia Pipit, Anthus antarcticus, has been lumped into Correndera Pipit, Anthus correndera due to very small DNA differences between them. Sibley and Monroe's (1990) Fringillidae included all of the remaining birds, over 1000 of them. Most authors use a finely-grained family structure for these species that roughly corresponds to Sibley and Monroe's tribes. 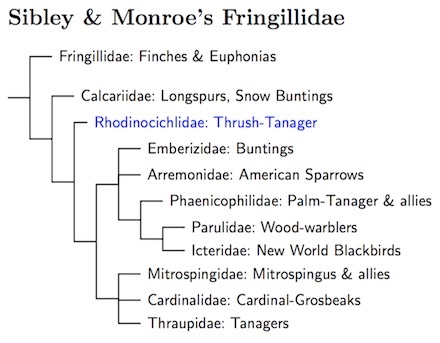 The TIF taxonomy divides Sibley and Monroe's Fringillidae into 11. Not long ago, the chlorophonias and euphonias were considered tanagers. Many guidebooks still list them as such, but it is not so. The AOU recognized them as finches in the 44th checklist supplement (2003), placing them in the subfamily Euphoniinae. Accordingly, they are placed in Fringillidae as a subfamily (Groth, 1998; Klicka et al., 2000; Yuri and Mindell, 2002; Zuccon et al., 2012). The Hawaiian Honeycreepers were once considered a separate family (Drepanididae). They are now thought to form a clade buried inside Carduelinae (Yuri and Mindell, 2002; Arnaiz-Villena et al., 2007b; Lerner et al., 2011; Zuccon et al., 2012). They are treated here as a tribe within Carduelinae. The arrangement of the finches is based on several sources. I originally relied on Groth (1998), Klicka et al. 2007, and Arnaiz-Villena et al. (1998, 1999, 2001, 2007a, b, 2008). Their studies have included a substantial number of finch species. However, some monotypic genera had been left out (e.g., Callacanthis, Chaunoproctus, Kozlowia, Neospiza). These have all been included in the analysis by Zuccon et al. (2012). The tribes within the Carduelinae are now based on Lerner et al. (2011) and Zuccon et al. (2012). Except for the basal position of the Coccothraustini, there had previously been a lack of consensus on the relationships between the Cardueline tribes. See Yuri and Mindell (2002), Arnaiz-Villena et al. (2007a), Nguembock et al. (2009a), and Töpfer et al. (2011). That has changed with the publication of Lerner et al. (2011) and Zuccon et al. (2012). Although the taxon sampling is different, the two papers are completely consistent at the generic level except for the placement of the Pyrrhulini. Zuccon et al. put the Pyrhullini sister to the Carduelini while Lerner et al. place it sister to the Carpodacini/Drepanidini clade. Note that “European Serin” on Lerner et al. 's tree is a typo as noted in the supplementary material. It actually refers to the White-bellied Canary. The combination of a large number of genes and attention to the problem of discerning the true species tree in spite of incongruent gene trees has led me to use the overall structure from Lerner et al. (2011). They use a large superset of the genes used by Zuccon et al., but only sample half as many taxa. The TiF tree of genera is 100% consistent with Lerner et al., and except for the placement of Pyrrhulini, is also consistent with Zuccon et al. It's nice to see so much consensus. The Fringillidae start with a basal Palearctic group, Fringillinae. Fringillinae is comprised of three species, one of which has spread across the northern Palearctic. The remaining Fringillidae fall into two sister clades, Euphoniinae and Carduelinae. The common ancestor of the Euphoniinae/Carduelinae clade was likely an Old World species. Something must connect it with the Neotropical Euphoniinae, but that something is missing without a trace. Being geographically contiguous and more similar in appearance, the position of the Carduelinae is easy to understand. Euphoniinae is a mystery that unscores the importance of extinction in creating the bird distribution we currently see. The split of the Blue Chaffinch, Fringilla teydea, from Common Chaffinch, Fringilla coelebs, was based on on Suárez et al. (2009). The further split of Gran Canaria Blue Chaffinch, Fringilla polatzeki, from Blue Chaffinch, Fringilla teydea, is based on Suárez et al. (2009) and the analysis by Sangster et al. (2016b). Zuccon et al. (2012) found evidence that the Antillean Euphonia is more closely related to the chlorophonias than to most euphonias. The two other blue-headed species are usually considered closely related to musica (sometimes treated as one species under the name Blue-hooded Euphonia), so all three have been placed in the genus Cyanophonia (Bonaparte 1851, type musica). As mentioned above, how the tribes with the Carduelinae relate has been somewhat contentious. There is considerable agreement that the holarctic Coccothraustini are basal. The results of Nguembock et al. (2009a) suggested that Carpodacus and Pyrrhula were fairly closely related to each other, as did Töpfer et al. (2011). Neither had much to say about their relation to the Hawaiian Honeycreepers (Drepanidini). Zuccon et al. (2012) were unable to clearly resolve the position of the honeycreepers (see Fig. 2), but Lerner et al. (2011) place them sister to the rosefinches (Carpodacini). The two together are then sister to the bullfinches and many arid-zone finches (Pyrrhulini). Lerner et al. place the whole lot of them are sister to Carduelini, which includes the American red finches (previously separated as a tribe). As mentioned before, Zuccon et al. disagree, placing Pyrrhulini sister to Carduelini. Zuccon et al. (2012) found that Eophona was embedded within Coccothraustes. A reasonable solution to this problem is to restore the two American species to Hesperiphona and leave the Asian species in a reduced Eophona. 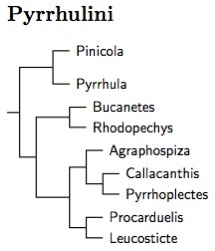 Pyrrhulini consists of 3 clades. The first consists of the Pyrrhula bullfinches and Pine Grosbeak (Pinicola). The second and third are sister, and are the arid-zone finches indentified by Arnaiz-Villena et al. (2008). The second clade includes Bucanetes and Rhodopechys. The third consists of the mountain-finches and rosy-finches (Leucosticte), together with several monotypic genera: Procarduelis (Dark-breasted Rosefinch), Agraphospiza (Blanford's Rosefinch), Callacanthis (Spectacled Finch), and Pyrrhoplectes (Golden-naped Finch). Both Procarduelis and Agraphospiza are usually included in Carpodacus. The bullfinches are arranged based on Töpfer et al. (2011). Kirwan and Gregory (2005) established the monotypic genus Eremopsaltria for the Mongolian Finch, separating it from Bucanetes. However, they acted under the misapprehension that the Mongolian Finch is more likely closer to the Common Rosefinch than to the Trumpeter Finch. Arnaiz-Villena et al. (2008) found a rather different result, with the two Bucanetes as sister taxa, and the rosefinch placed rather distantly from them. Zuccon et al. (2012) confirm this. Arnaiz-Villena et al. (2008) found that the Dark-breasted Rosefinch, formerly Carpodacus nipalensis belongs in the same clade close to Leucosticte. Rather than folding it in Leucosticte, I restored the genus name Procarduelis (Blyth 1843). I had previously noted that Blanford's Rosefinch is thought to be close to nipalensis. Indeed, Zuccon et al. found it in the other portion of this clade. It is sufficently distant from its sister group (Callacanthis and Pyrrhoplectes) to deserve a separate genus. Zuccon et al. (2012) established the name Agraphospiza for it. I follow AOU in listing three North American rosy-finches. Some have even suggested further splitting the Gray-crowned Rosy-Finch. They have also been all been lumped into one species in the past. Drovetski et al. (2009) find little genetic difference between the three, suggesting that they may be lumped again. The arrangement of the rosefinches is based on Tietze et al. (2013). Their analysis has much in common with Zuccon et al. (2012), but is more comprehensive. Now that we had a decent understanding of how the rosefinches relate, it makes sense to put the whole group in the genus Carpodacus. There is a basal clade consisting of the Common Rosefinch (previously moved to Erythrina) and the Scarlet Finch (aka Haematospiza). Interestingly, the extinct Bonin Grosbeak (aka Chaunoproctus) is sister to the remaining rosefinches. The rest of Carpodacus splits into two clades. The first ranges from Blyth's Rosefinch to Taiwan Rosefinch. The Taiwan Rosefinch, Carpodacus formosanus, has been split from Vinaceous Rosefinch, Carpodacus vinaceus, based on Wu et al. (2011). 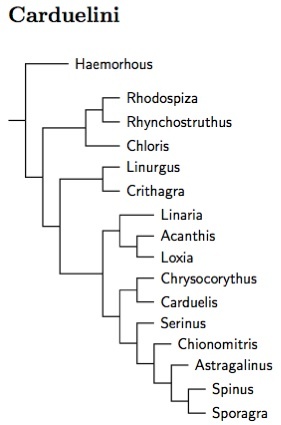 The second clade includes synoicus group, the former Kozlowia (C. roborowskii), the Rubicilla clade (Streaked and Great Rosefinches), the former Uragus (C. sibiricus), Pyrrhospiza (C. puniceus), and Pinicola subhimachala (aka Propyrrhula subhimachala). It ends with a group including the Carpodacus type species Pallas's Rosefinch, Carpodacus roseus (see Banks and Browning 1995), through C. dubius. Tietze et al. (2013) found substantial genetic distance between the Sinai Rosefinch in the strict sense C. synoicus synoicus, and the Pale Rosefinch group (subspecies beicki, salimalii, and presumably stoliczkae). These have been suspected of being different species, and I have now split them. I moved Sillem's Mountain-Finch (rediscovered in June 2012) from Leucosticte (Pyrrhulini) to Carpodacus based on a photo of what is believed to be the female. When Roselaar (1992) named Sillem's Rosefinch, he put it in Leucosticte. At the time, the female plumage was unknown. The other Leucosticte have female plumages that are only slightly different from the male, usually just duller. As Roselaar pointed out, if it has a distinctive female plumage, it would more likely related to Kozlowia (now part of Carpodacus) than to Leucosticte. More recently, Muzika (2014) has made the same point. Yann Muzika's photo of the probable female Sillem's shows a bird that is quite different from the adult male. See Kazmierczak and Muzika (2012) for an account of this rediscovery and Muzika (2014) for further observations. A DNA analysis by Sangster et al. (2016a) has confirmed that Sillem's Mountain-Finch is a Carpodacus rosefinch, and as expected, is sister to Tibetan Rosefinch, Carpodacus roborowskii. Tietze et al. (2013) also found a surprisingly small genetic distance between the Caucasian and Spotted Great-Rosefinches (rubicilla and severtzovi) and recommended lumping them. Although I have followed that advice, further study is in order. Rasmussen and Anderton (2005) recommended splitting them based on differences in plumage, habitat, and voice. The results in both Lerner et al. (2011) and Zuccon et al. (2012) support the Drepanidini as sister to Carpodacini (not just the Common Rosefinch, as might be inferred from the press coverage). Interestingly, the extinct Bonin Grosbeak is a relatively basal member of the Carpodacini. Perhaps it too is a relic of the spread of the ancestral Carpodacini/Drepanidini into the Pacific. The order here is based on a combination of the DNA study of Lerner et al. (2011) and the osteological study of James (2004). Fleischer et al. (2001), Pratt (2001), Arnaiz-Villena et al. (2007b), and Reding et al. (2009) have also been consulted. It fits nicely with morphology (look at bill shapes in each clade) and subfossil taxa can be easily accomodated using James (2004). This is pretty similar to the previous version, but tweaked based on Lerner et al. (2011), which greatly decreases the conjecture needed, and increases my confidence in it. The genera Palmeria, Himatione, and Vestiaria have been merged into Drepanis. The genetic distance between them seems to be small (Lerner et al., 2011) and there is evidence of hybridization between Vestiaria and Himatione (Knowlton et al., 2014). Olson (2012b) also argues that this is a reasonable treatment. Although I think the genera I use for the Hawaiian Honeycreepers are oversplit, I consider the AOU genera even more oversplit. I haven't gone further on the lumping because data on the extinct species is too limited. Although Pratt (2009) has established the genus Manucerthia for the Hawaiian Creeper, Loxops mana, I have not adopted it. Lerner et al. (2011) make clear that the Hawaiian Creeper is sister to the other Loxops. Moreover, they shared a common ancestor about 2 million years ago and do not seem so different as to justify introducing an extra genus into a tribe that already has too many genera. I have kept the genus Akialoa merged with Hemignathus as Akialoa appears to be paraphyletic (see the trees in James, 2004). However, portions of Hemignathus have been split off as Chlorodrepanis and Viridonia. This has allowed restoration of the name Hemignathus wilsoni for the Akiapolaau (Hemignathus munroi). When Chlorodrepanis virens is subsumed in Hemignathus, the name wilsoni belongs to a subspecies of virens. The situation with the Kauai Amakihi, Chlorodrepanis stejnegeri is similar. In Hemignathus, the name stejnegeri belongs to a subspecies of the Greater Akialoa, Hemignathus ellisianus stejnegeri, and the Kauai Amakihi uses the substitute name H. kauaiensis. This changes clade sizes and I have also reordered the Hawaiian Honeycreepers as a result. This brings us to the Carduelini. It has become apparent that the North American Carpodacus finches are not that closely related to the true Carpodacus finches. Previously, the TiF list used the genus Burrica, also used as a subgenus by AOU (2nd-5th AOU checklists). However, the oldest available name seems to be Haemorhous (Swainson 1837, type purpurea—compare Burrica Ridgway, 1887, type mexicana) and I have now adopted that. Haemorhous appears to be sister to the rest of the Carduelini, and rather distantly related. Perhaps it would even make sense to treat it as a separate tribe (as done previously in the TiF list). I follow the recent paper by Zuccon et al. (2012) to arrange the various Cardueline genera. Lerner et al. (2011) gives essentially identical results for the taxa they included. Previous studies did a decent job at the generic level, and sometimes for groups of genera, but were unable to get strong support for any method of arranging them. Thus the papers by Arnaiz-Villena et al. (1998, 1999, 2001, 2007a, b, 2008) and Zamora et al. (2006) have been used in ordering the species and determing the exact generic boundaries. Unfortunately, the papers by Arnaiz-Villena and colleagues have been completely useless for determining deeper relations. One wonders whey they continue to reuse the same data rather than collecting more. Nguembock et al. (2009a) has also been helpful at higher levels, but I rely on Lerner et al. and Zuccon et al. for the overall structure. The various studies of the finches have made it clear that the genera Carduelis and Serinus both required substantial surgery. The alternative for Carduelis would be to put almost all of the Carduelini into one genus! For Serinus, the alternative is less drastic, mainly because Carduelis has priority. Neither of these outcomes is particuarly desirable, so both Serinus and Carduelis have been divided into several pieces each. 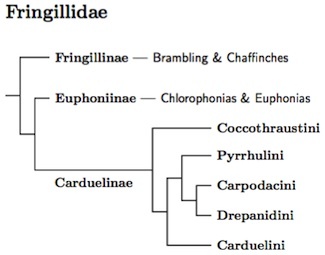 As constituted here, Carduelini contains 4 major clades. As mentioned above, the first clade includes only a single genus: Haemorhous — the American purple finches. The second includes the Chloris greenfinches (sometimes included in Carduelis), the Desert Finch (Rhodospiza), and the the Golden-winged Grosbeaks (Rhynchostruthus). Kirwan and Grieve (2007) argue that Rhynchostruthus includes three species. The third Carduelini clade is exclusively Afrotropical. The Oriole Finch (Linurgus) is sister to the rest. These closely related birds are variously called canaries, seedeaters, serins, and siskins and are all placed in the genus Crithagra. The species-level phylogeny still needs some work, as might be guessed from the question marks, polytomies, and blue ink. I recognize several subgenera. Besides Crithagra, there are Dendrospiza, Neospiza, Pseudochloroptila, and Ochrospiza. All are marked on the species tree. Subgenus Crithagra includes most of the larger African canaries and allies. The Sao Tome Grosbeak has usually been included in Neospiza. Stervander (2010) found that the Principe Seedeater is it's closest relative and both species together form subgenus Neospiza. In fact, Stervander found that the Sao Tome subspecies of the seedeater (thomensis) appeared more closely related to the Sao Tome Grosbeak than to the seedeater. The two birds are quite distinct, and it seems unreasonable to put them in one species. Perhaps the genetic results are a sign of introgression. It's not entirely clear whether subgenus Pseudochloroptila belongs in subgenus Ochrospiza, so they are kept separate. Both the Yemen Serin, Crithagra menachensis, and Ankober Serin, Crithagra ankoberensis, remain somewhat mysterious. These have be considered conspecific by some, or in separate genera by others. I have little confidence in their placement here (hence the blue color on the tree), but it seems at least as reasonable as any other. This clade is expected to get a revision when more information becomes available. The fourth Carduelini clade is more cosmopolitan. The basal piece includes the Palearctic Linnets (Linaria, formerly Carduelis), which are sister to the holarctic Redpolls (now Acanthis rather than Carduelis) and crossbills (Loxia). There is some uncertainty about the linnets. The mitochondrial dna consistently puts them near the siskins and American goldfinches rather than near the redpolls and crossbills. The nuclear dna does the opposite. Since they seem more akin to the redpolls and crossbills, and since the combined analysis puts them there, I have followed suit. The redpolls themselves are an interesting case. It's not clear how many redpoll species there are. There is evidence that at least two are good biological species (e.g., Knox, 1988). In fact, Knox et al. (2001) support separation of Lesser Redpoll, Acanthis cabaret. However, genetic studies have failed to find any differences between Lesser and Common Redpolls (Ottvall et al., 2002). Worse, Marthinsen et al. (2008) found little genetic difference between any of the redpolls! There may be only one redpoll species. Indeed, Mason and Taylor's detailed study using SNP's (2015) found little genetic differentiation among the redpolls. At this point the balance of the evidence is that there is only one species involved. As a result, I've lumped them all as a single species, Holarctic Redpoll, Acanthis flammea. I thought about referring to them as just “Redpolls”, but added the adjective Holarctic to emphasize that all races have been grouped together. It's also not really clear how many red crossbills there are. I continue to follow the AOU and BOU taxonomy for the crossbills, but Benkman et al. (2009) make a case for considering the “type 9” crossbills of Idaho to be a separate species, South Hills Crossbill, Loxia sinesciuris. See also Parchman et al. (2006). However, it is doubtful there's any real genetic differentiation (Piertney et al., 2001). I also wonder whether it would be better to lump the Parrot and Scottish Crossbills into Red Crossbill. The other piece of this final clade includes the true Carduelis and Serinus finches of the Palearctic. It starts with the Mountain Serin of Indonesia and the Philippines. The Mountain Serin is sometimes considered part of Serinus, but I've had it in its own genus, Chrysocorythus, for a while. Zuccon et al. (2012) found Chrysocorythus sister to the true Carduelis finches, now reduced to the European Goldfinch and the Corsican and Citril Finches. These two genera together are sister to the rest of the clade. The now-reduced Serinus comes next, followed by the Tibetan Serin. It's in Chionomitris rather than Serinus. Most of the remaining Carduelini are from the Americas. There are two classification schemes in current use. The AOU's NACC puts them all together in genus Spinus. The AOU's SACC separates them into three genera: The North American goldfinches, Astragalinus; the northern siskins Spinus; and the Middle and South American siskins, Sporagra. Astragalinus splits off first, and the final division is between Spinus and Sporagra. Several Carduelis siskins have moved to Spinus (including Lesser Antillean Siskin). In another taxonomic note, the Pine Siskin, Spinus pinus, and Black-capped Siskin, Spinus atriceps, are quite close. Some have suggested they are conspecific. Although they don't comment on it, the genetic tree in Arnaiz-Villena et al. (2008) suggests another possibility. The subspecies perplexus may actually belong to S. atriceps, as had been suggested by Banks in 1982 (see a 2008 AOU proposal). The placement of Spinus may be a little soft. E.g., in Nguembock et al. 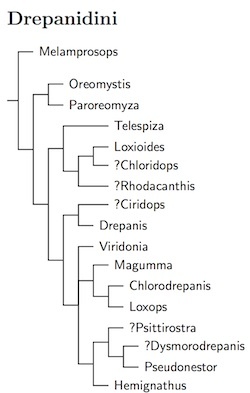 (2009a), it appeared in different places in the combined tree (their Figure 4) and some of the individual gene trees. This is the subject of some discussion in Nguembock et al. The arrangement here is based on Zuccon et al. (2012) and Beckman and Witt (2015). These three genera were formerly considered part of Carduelis. The AOU currently treats them all as Spinus, and rejected a proposal to make these last two generic splits, also proposed by Nguembock et al. One has to be careful with the genus name for the South American siskins. Both Sporagra (Reichenbach 1850, type magellanica) and Pyrrhomitris (Bonaparte 1850, type cucullata) come into consideration. The publication date of Sporagra seems to be June 1, 1850. The publication date for Pyrrhomitris is not as clear. Bonaparte's “Conspectus generum avium” was published in sections beginning in mid-1850. The first part was already available in mid-June, and likely published a bit earlier, perhaps earlier than Reichenbach. However, Pyrrhomitris was not included in the section I, nor was it even included in the first part of section II (published by Oct 15, 1850). It appeared in the second part of section II (dated Nov 10, 1850 and certainly published before Feb 3, 1851). If I understand the ICZN correctly, the parts should be treated as separate publications, in which case it appeared either in the later part of 1850 or early 1851. That would give priority to Reichenbach's Sporagra. In this case there is further evidence of which was published first. Bonaparte refers to Sporagra on page 516, the page before he establishes Pyrrhomitris. Based on Beckman and Witt (2015), the Hooded Siskin, Sporagra magellanica, has been split into Lowland Hooded Siskin, Sporagra magellanica, and Andean Hooded Siskin, Sporagra capitalis. We lack complete information on the subspecies, but I've tentatively allocated boliviana, alleni, icterica, longirostris, and magellanica to the lowland group, S. magellanica, and capitalis, paula, peruana, urubambensis, santaecrucis, hoyi, and tucumana to the Andean group, S. capitalis. The genetic distances between the capitalis group and atrata, crassirostris, siemiradzkii is razor-thin, calling their species status into question. Even uropygialis appears to be closely related to the capitalis group. Further study is needed to sort out these taxa.